SEQUOYAH COUNTY, Oklahoma - The Sheriff in an eastern Oklahoma county said his office is investigating what could be a case of spontaneous combustion. Sequoyah County Sheriff Ron Lockhart told News On 6 that deputies were called to a house on Bawcom Road, between Sallisaw and Muldrow, around 10:50 a.m. Monday. A neighbor had reported seeing smoke coming out of a home. Lockhart said they found the nearly completely charred remains of a man in the kitchen, but that there was no other damage done to the home. The man has been identified as 65-year-old Danny Vanzandt, according to CBS affiliate in Fort Smith, KFSM. Sheriff Lockhart spent about 20 years as an arson investigator for the Fort Smith, Arkansas Police Department, before retiring to run for Sheriff in Sequoyah County. Lockhart said he'd never seen anything like it. He said it didn't seem that any accelerant was used and only the floor below Vanzandt's body was damaged. Lockhart said his remains have been sent to the Medical Examiner's office in Tulsa for examination. Lockhart said Vanzandt was an alcoholic and a smoker. But KFSM reports that Lockhart said Vanzandt's body was burned in a way that was inconsistent with the fire being started by accident, such as by dropping a lit cigarette. The Sheriff said the investigation is still ongoing, but that he is not ruling it out spontaneous combustion as the cause of the fire. 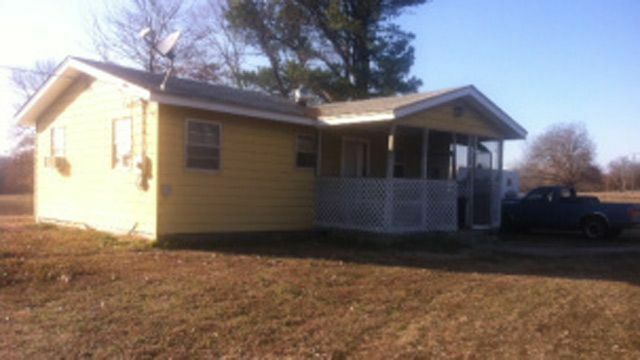 Photo of the deceased's home, from CBS-affiliate in Fort Smith, KFSM. Interesting point - the alcohol thing. I never heard that. Alcohol is flammable. The most famous one is the doctor in the bathroom. All that was left of him was his walker and a slipper, if memory serves. As far as I know, no cause was ever found. I had a former friend, (the same one who thought her two daughers were tumors), whose grandmother never drank water; only beer and wine. Just a guess! I have no basis for this. A long time ago I read something about Spontaneous Combustion. I *think* I remember one theory had something to do with a wick effect. Like, the fat in the person is fuel for the fire. I dunno. It's a pretty crazy thing, if there is no other explanation. The fact that the person can be so burned and the whole room doesn't catch fire is strange. Aren't most of the people who make the news for SC thin? Do you know of any instances of a large person possibly igniting? I know some anorexics have a high level of body fat even though they may weigh 80 pounds. The theory about the alcohol is that it produces highly flammable Acetone in the body. There was a programme on UK TV about 10-15 years ago where a scientist burned a pigs carcass to demonstrate the Wick effect, I can't see it on the web but I'll keep looking.